When the initial trailer for Mutant Year Zero: Road to Eden dropped we had no idea what we were getting ourselves into – it sounded like the opening to a bad joke; a pig, a duck, and woman walk into a broken down shack of a place… We were even more shocked to discover this was not an RPG or FPS but instead a turn based tactical combat game in the vein of XCOM. After taking a skeptical moment to let that sink in, we finally got a chance to see Mutant Year Zero in action and we were more than impressed at the new features and adaptations in place to make the game both familiar and fresh at the same time. Not quite sure what we mean? Check out our gameplay below. 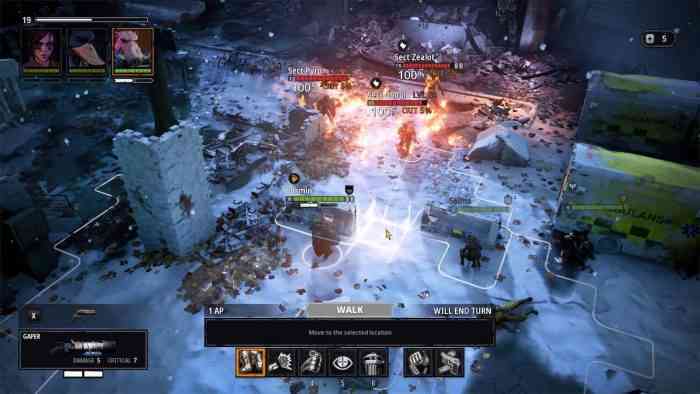 Mutant Year Zero: Road to Eden is a turn based tactical combat adventure game taking place in a post-human Earth. The dust has finally settled after years of destruction and war. The humans have been wiped out, and nature has once again started to reclaim the Earth. Those that are alive are mutated creatures trying to survive in the harsh world that remains. Your team of mutants is on a quest to find the fabled city of Eden, the one place untouched by devastation in a dangerous and unforgiving world. The game allows players to move about the map freely when not engaged in combat and will instantly swap to a wonderfully built turn basted tactics system for taking on enemies. It’s a smooth and creative balance for this unique narrative and is sure to kick off new inspiration for how the XCOM style gameplay can be utilized in the future. Mutant Year Zero: Road to Eden is set for release on December 4 and will be available on PC, PlayStation 4, and Xbox One. For more information, check out the game’s official website, and be sure to let u know your thoughts on the game on Facebook, Twitter, or the Comments section below.